A recent report based on the Assocham-PwC study revealed that there will be a rise of 67% in the average annual spending of Indians on online purchases to Rs 10,000 next year. As far as the data this year is concerned, online shoppers spend around Rs 6,000 a year on average at present. The number of consumers who purchased something online this year as per the report is 40 million. It however is pegged to 65 million for the next year. The key factors accounting this growth are believed to be a better infrastructure in terms of logistics, broadband and internet-ready devices. The overall e-commerce industry, which is valued at $17 billion, is expected to cross the $100 billion mark in five years, growing at a compounded annual growth rate of about 35% each year. Indian ecommerce players like Snapdeal and Flipkart are enjoying edge over global competitors like Amazon in the country at present. 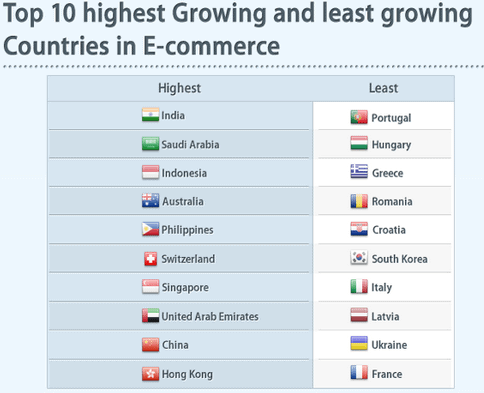 A lot of top global firms and leading Indian industry leaders like Azim Premji and Ratan Tata have invested and are planning to invest in the Indian ecommerce sector. Online apparel sales along with the computer and consumer electronics sector continue to capture a greater share of India retail ecommerce, powering the overall market growth. Moreover, as per the report, these will be contributing 42% of the total retail e-commerce sales in 2015 from the current level of 39%. “The smartphone and tablet shoppers will be strong growth drivers. Mobile phones already account for 11% of e-commerce sales, and their share will jump to 25% by 2017,” Assocham secretary general DS Rawat said. The travel and tourism sector in India is second fastest growing travel and tourism industry in the world and on top of it almost 75% of total travel related business has moved to e-commerce. Keeping fact in mind that almost one-third of internet users already making purchases online, the study says that the ecommerce growth will rely more on increased spending from existing buyers than first-time online buyers. The report also stated that the ecommerce industry in India is expected to spend an additional $500 million to $1 billion on logistics functions, leading to a cumulative spend of $950 million to $1.9 billion till 2017-20. As far as the employment is concerned, there will be an additional employment of close to 1,00,000 people in these two functions alone by 2017-20 as per the estimation. At present, more than 25,000 people are already employed in e-retailing warehousing and logistics.